When I was a kid, we lived first person shooters, running around with vests and pistols in a game called Lazer Tag. 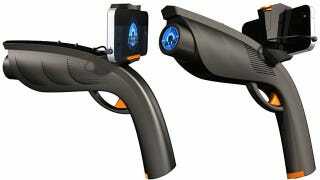 It's long gone, but this new Xappr Gun for smartphones looks like it might recreate some of that fun. On its own it makes playing motion controlled shoot-em-ups and augmented reality titles slightly more realistic, but that's nothing we haven't seen before. What will make the $30 Xappr gun unique, when it's available this Spring, is player-to-player combat with an upcoming game called ATK.